1. Perfect and complete in quality or nature: Glenn described his lady friend as an example of absolute perfection. 2. Not limited by restrictions or exceptions; unconditional, total trust: Earl told Diane that she had his absolute confidence. 3. Unqualified in extent or degree; total: Marie could hear a pin drop in the absolute silence of the room. 4. Unconstrained by constitutional, a counterbalancing group, or other provisions, etc. in the exercise of governmental power; especially, when arbitrary or despotic: James was an absolute ruler in his position as the absolute monarch. 5. Not to be doubted or questioned; positive, certain: The police have absolute proof of Philip's guilt. 6. Relating to units of measurement derived from fundamental units of length, mass, and time: The laboratory was supplied with the necessary equipment to determine the absolute temperature of the liquids. 7. Noting or pertaining to the scale of a grading system based on an individual's performance considered as representing his or her knowledge of a given subject regardless of the performance of others in a group: Jessica's absolute performance during the year qualifies her for the special graduation honors. 8. Etymology: from Latin absolutus and absolvere, "to set free, to make separate". 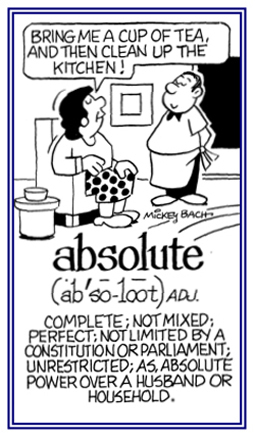 Logically, absolute terms cannot be compared, as with "more" and "most", or used with an "intensive modifier"; such as, "very" or "so" because something either is complete or it is not. It cannot be "more complete" than something else; consequently, sentences; such as, "Mike wanted to make his record collection more complete", and "Joyce can improve the sketch by making the lines more perpendicular", are often criticized as being illogical. The potential difference necessary to produce a current of one ampere through an electric circuit with a resistance of one ohm (unit of electrical resistance): Because the production of absolute current and voltage must equal mechanical power, experiments that realize the absolute volt involve mechanical effects and are inherently difficult; usually, requiring many years to complete. Totally, definitely, beyond doubt, and without question: Iron is absolutely necessary for the production of many products. Eugene, are you absolutely sure that we are on the right road and that we are not absolutely lost? Victor and Martin are absolutely opposed to the idea of making any additional changes. 1. A freeing from sin, guilt, or blame; or a declaration that frees a person from guilt or punishment for sin: The priest gave absolution to church members which always makes the parishioners feel a great deal better. 2. Release from a duty or promise; a discharge: The soldier obtained absolution from the charges made by a fellow soldier. 1. To officially state that someone is free of any blame or responsibility in a particular matter: Mr. Johnson, the lawyer, could not get the court to absolve his client of responsibility for the accident. Because new evidence had been discovered, Rick, the defendant was absolved of the criminal charge. 2. To forgive someone; especially, for a religious or moral fault: Mary asked the priest to please absolve her of her sins. 3. To relieve a person of some kind of requirement or obligation: The court absolved Ernest of the responsibility of any further repayments of the loan. At the board meeting that day, they agreed that they would be absolving the company of any charges of misdeeds. Bert was absolved of having to pay his partner's debts. 4. 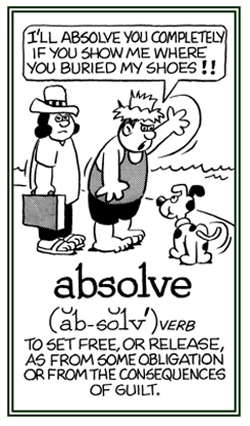 Etymology: from Latin ab-, "from" + solvere, "to loosen". © ALL rights are reserved. Someone who has authority to pronounce a person clear of guilt or blame: The priest was an absolver of the sins of Phillip who had strived to overcome his moral indiscretions and petty misdeeds. Showing page 9 out of 13 pages of 191 main-word entries or main-word-entry groups.